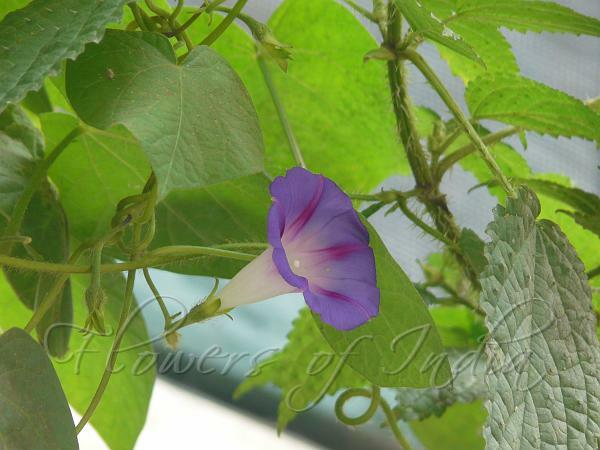 Common Morning Glory is a morning glory vine native to Mexico and Central America, but widely naturalized in India. Like all morning glories the plant entwines itself around structures with its viny stems, growing to a height of 2-3 m tall. The stems are covered with brown hairs, which is an identifying feature. Leaves are heart-shaped, 4-15 cm long. Flowers are borne on 1-5 flowered stalks in leaf axils. The flowers are funnel-shaped, 4-6 cm long diameter. The flower color varies from purple, pale blue to white. On the average, the leaves are much larger than the flowers. In the Blue Dawn Flower, leaves are smaller than, or of the same size as, the flowers. The habitats of morning glories are landscapes, fences and crops. The plant is predisposed to moist and rich soil, but can be found growing in a wide array of soil types. Although it is often considered a noxious weed, Common Morning Glory is also grown for its beautiful purple, pink and white flowers and has many cultivars. Photographed in McLeod Ganj, Himachal Pradesh.